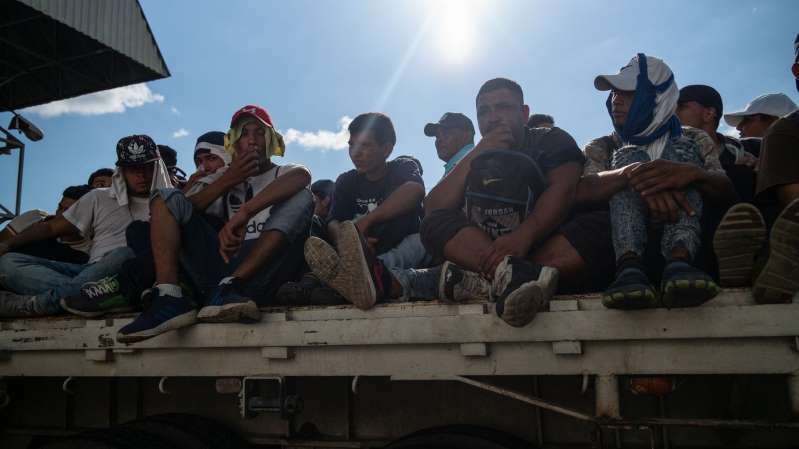 In a conference call to discuss new numbers on illegal border crossings with reporters, two senior administration officials could not provide evidence for the president’s claim that terrorists are embedded with the migrants. One official referred reporters to Mexican authorities. Mexican officials have not made any statements about people of Middle Eastern descent in the migrant group. A group of refugees and asylum seekers ride in the trailer of a truck in the town of Huehuetan, Mexico, on Oct. 22. The data indicating a rise in illegal migration was released as Trump has ratcheted up his rhetoric against immigrants before the midterms. The timing of the announcement is consistent with the border patrol’s past practices. More families are illegally crossing together, the border patrol reported. In September, 16,658 people were caught crossing with at least one other relative, up from just under 13,000 in August and 4,200 in September 2017. Trump said Monday that he will cut U.S. aid to the three Central American countries that are home to most of the migrants who cross the southern border -- El Salvador, Guatemala and Honduras. It’s an effort to punish the governments for their citizens’ migrations that may backfire. Much of the money funds counter-narcotics, law enforcement and anti-poverty programs that Trump’s critics say can help make the countries more desirable places to live. The press office of the Honduran presidency didn’t immediately reply to written questions seeking comment. --With assistance from Benjamin Din and Matthew Bristow.